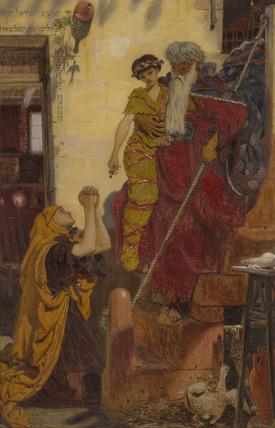 The elderly figure of Elijah descends down a flight of stairs on the right carrying a boy dressed in grave clothes. The boy's mother kneels on the left with her arms held up in prayer. A chicken with a chick balanced on its back is in the bottom right corner. There is a doorway behind the mother with hebrew writing over the top and a wine bottle set into the wall. The swallow using this as its home casts a shadow on the wall. Presented by Sir John T Middlemore, Bt., 1912.